While all nurses are charged with handling patients’ needs and making sure they’re seeing the right physician, a critical care nurse has a far more high-stakes job that typically involves getting patients to immediate treatment or seeing them through an extremely risky recovery. This position is generally offered only to highly educated, highly seasoned nurses, with years of experience and the right educational context to make quick, healthy decisions on behalf of patients who are often unable to make the proper care assessments for their own needs. This profession can be broken down into several key responsibilities and venues. Critical care nurses aren’t generally needed at all medical facilities. Their expertise and services generally wouldn’t benefit the type of patient who visits a family health clinic, for example. Instead, critical care professionals are often employed by large hospitals. They offer their services in emergency rooms, intensive care units, surgery recovery areas, cardiac centers, stroke treatment facilities, and telemetry departments. This allows them to be on the scene when any major event happens, whether it’s a heart attack, an accident, a mysterious illness that warrants an ER visit, or something similar. Education and Experience: What’s Required of the Critical Care Professional? Critical care means having the experience and education necessary to make split-second decisions for patients. It also means having the right experience necessary to provide preventative care during recovery, offer physician assistance during emergency incidents, and more. This means that any nurse eligible for such a position must at least have a Bachelor of Science in Nursing degree. Typically, a two-year associate’s degree in nursing is not considered sufficient for the type and level of care expected of these professionals. 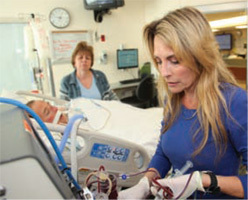 To become an ideal candidate for this role, nurses may even want to pursue their MSN, or Master of Science in Nursing. Most nurses who fit into this type of role also have a great deal of experience in nursing itself. Most hospitals won’t promote nurses who have fewer than five or 10 years of experience, because they simply don’t believe that limited experience gives nurses the context they need to provide this type of assistance, decision-making, and patient care. Critical care nurses are considered a decision-making position, able to function as the patient’s representative when crucial surgery or restorative procedures are needed by the patient lacks the ability to speak for themselves. They will also be a representative for the patient’s moral values, healthcare directives, and living will. Critical care nurses will work alongside patients who can represent themselves to explain key surgeries, treatments, and procedures needed to alleviate a serious condition. They’ll navigate the red tape on behalf of patients and secure treatment far more quickly than would be available in a non-urgent, non-emergency car setting. Helping patients get fast access to emergency surgeries, medications, and other treatments, is an essential part of any major hospital’s job. In many cases, the speed with which corrective action is taken directly affects the patient’s chance of survival and recovery. According to the American Association of Critical Care Nurses, those who work in hospitals as critical care nurses will do their best to take quick actions, make fast and sound decisions, and represent patients throughout every step of life-threatening treatment, surgery, and recovery.